We kindly invite all European universities, regional governments, companies and other institutions to start cooperation with our Group. 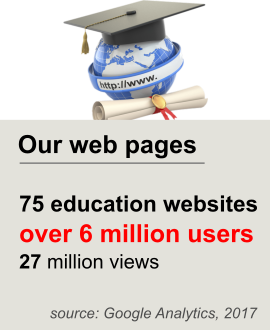 We have 75 internet portals which provide practical information for college candidates, students and graduates. In summary 48 of our portals are in Polish, several in English and one of each in below listed languages: Arabic, Chinese, Czech, French, Spanish, German, Portuguese, Russian, Slovak, Turkish, Hungarian and Italian. In 2017 the complete group of portals had more than 6 millions of users (source: Google Analytics). This group consists of 36 websites in polish language directed to college candidates, students and graduates. studentNews.pl - is our first and most important portal within the group. The website contains comprehensive information for students and graduates. Information is divided into following sections: studies, colleges, languages, career, science, hi-tech, health, culture, travels and sports. In addition, the portal has 16 local student's guides, which is one for each province in Poland. In 2017 the portal had 2.9 million users and 6 million views (source: Google Analytics). dlaMaturzysty.info - our second most visited website is directed to young people who are graduating high school and preparing to take their matriculation exam. Google Analytics report shows, that in the year of 2017 the website dlamaturzysty.info had record-breaking number of 1.1 million users and 11.5 millions of views (source: Google Analytics). It means that we are able to reach majority of high school graduates. Search tool which allows searching for university's majors according to subjects taken during final exam: http://kierunki-studiow.dlamaturzysty.info. In Poland college enrolment depends on the matriculation exam's results. Universities create their own criteria according to which candidates are recruited. Other practical information, such as: sheets, calendars, rules or maturity exam's result analysis. Those websites describe studies in Europe for college candidates, students and college graduates. The users can choose one of 15 languages. In years 2014-2017 this group of portals reached 1.2 million users and 4.9 million views (source: Google Analytics). - Search tool for studies in Europe: studies-in-Europe.eu, undergraduatestudy.eu, postgraduatestudy.eu, doctoralstudy.eu, mba-studies.eu, distancelearningstudy.eu, top-mba.eu. The website "edubaza.pl" provide with important information about schools, educational agents, teachers' courses, student hostels and other useful articles related to education. In 2016 the portal had 1.29 million users while in 2017 already 2 million users (source: Google Analytics). The website kwalifikacjezawodowe.info provide with occupations and qualifications' description, as well as courses of every kind. In 2016 the portal reached 132 thousand users while in 2017 - 165 thousand (source: Google Analytics). Other special websites are: dlaprzedszkolaka.info, dlaucznia.info and dlagimnazjalisty.info. We are also managing websites dedicated to language learning: gramatyka-angielska.info, ang24.pl, szkolyjezykowe.info, kursyjezykowe.biz.